As highlighted in this Trends on Tuesday post, time spent on mobile phones—about 3 hours per day—has surpassed that of daily PC usage. This yields a significant opportunity for consumer interaction with federal agencies’ mobile apps, not just websites, and social media outlets. To take advantage of new opportunities for consumer interaction, federal agencies are implementing social media as part of their mobile products. We surveyed the mobile products submitted to the Federal Apps Registry to see how agencies are incorporating social media into their mobile products. We found that agencies are using social media in 3 general ways. Crowdsourcing via social media and interacting with other users with similar interests and concerns. Three particularly unique examples of the crowdsource approach include: SaferCar, Save Our Citrus, and Dolphin and Whale 911. SaferCar is an application by the National Highway Transportation Safety Administration which allows users to upload and share information pertaining to vehicle safety. Users are able to access other reviews and share reviews of their own while the agency has access to copious amounts of user feedback and experiences. With Save Our Citrus, users are able to upload and share photos with citrus experts within the Department of Agriculture and other producers. This innovative app provides timely feedback and advice concerning insect damage, herbicide consultations, and general production questions. 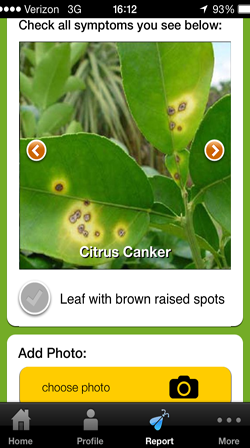 When reporting an issue, users are able to describe the location of the plant, check any symptoms with pictured descriptions, and upload their own photo. 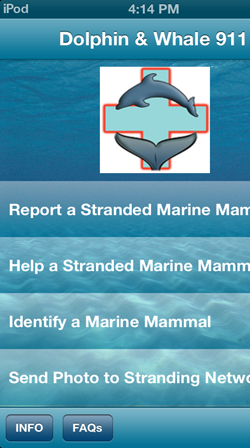 The Dolphin and Whale 911 app from the National Oceanic and Atmospheric Administration (NOAA) showcases crowdsourcing by enabling users to take and share photos of marine animals (including corresponding GPS coordinates) with marine mammal stranding network organizations. Organizations are then notified of the injured animal and are able to take the corresponding measures in aiding it. What does this mean for federal agencies? The time to move forward with mobile strategies that involve users with social media has arrived, and the Mobile Gov and Social Media Communities of Practice are here to help!Zeshan Khan, a rising junior enrolled in Virginia Tech’s Pamplin College of Business, is striving towards a degree in Business Information Systems. Katie Steffy, a rising senior at Virginia Tech, is earning a double degree in Dairy Science and Political Science with an emphasis in Legal Studies. Both are interning with the Mobile Gov team this summer. This article is part of this month’s editorial theme on Social Media. Check out more articles related to this theme.